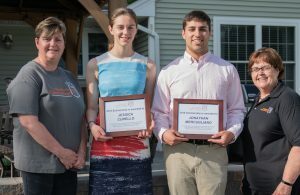 Cheshire’s Lights of Hope Vice President Jennifer Walsh, left, and Secretary and Sponsorship Committee Chair Kathy Kirby, far right, present scholarships to Jessica Curello and Jonathan Mercugliano. This is the 10th year Cheshire’s Lights of Hope has awarded scholarships to graduating seniors who best exemplify the organization’s mission and vision. The Scholarship Committee considers the amount of type of volunteer work performed, focusing on community service within the town, of Cheshire; the number of years of service; and the impact of applicant’s service in the Cheshire community. Jessica Curello has supported several community organizations and is a member of the National Honor Society. She is a volunteer in the Elim Park Rehabilitation and Life Enrichment departments and also independently organized shows for residents at local assisted living facilities. As a Girl Scout, Curello earned the Gold Award, the highest achievement obtainable in the organization, in recognition for the Lyme Prevention Education project she designed to educate pre-school children through parents. She is a Counselor in Training at YMCA Camp Sloper and Religious Education Teacher and Assistant at St. Bridget’s Church. Curello is also an active volunteer and participant with Best Buddies, Science Quest, Cheshire High School Link Crew, Cheshire High School Community Service Club, Daughters of the American Revolution, and Dance City & The Arts. Curello will study nursing at Southern Connecticut State University. Jonathan Mercugliano is a junior member of the Cheshire Volunteer Fire Department, where he has served as Cheshire Fire Junior Captain and given over 400 hours of service to the community by participating in drills, meetings, training and responding to fire calls. Mercugliano has volunteered 100 hours to Cheshire’s Lights of Hope, serving as the President of the Cheshire High School Club, a Street Captain and Youth Ambassador to the Executive Committee. He is also a Religious Education Assistant Confirmation Teacher at St. Bridget’s Church, teaching catechism to 9th and 10th grades, and has volunteered with Best Buddies, CHS Link Crew and Cheshire Junior Football. Mercugliano will study criminal justice at University of Hartford.